Interestingly, the draft of the Assets Declaration Scheme had been vetted by the Ministry of Law and Justice. 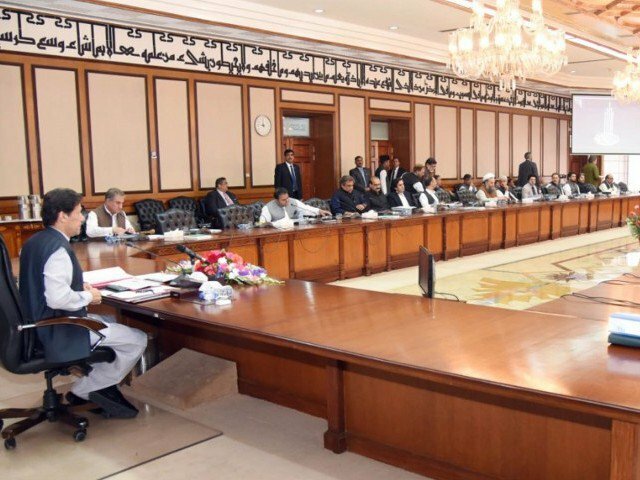 The federal cabinet has deferred its decision on the proposed tax amnesty scheme after it failed to evolve consensus with some ministers saying it could pose political and constitutional challenges for the authorities. Some cabinet members apprised Prime Minister Imran Khan that the scheme was not politically sellable and could also be challenged in courts, according to government sources. The main objection came from Federal Minister for Law and Justice Barrister Farogh Naseem who argued that the draft was in violation of the Article 25 of the Constitution, the cabinet members told The Express Tribune. Federal Minister for Communications Murad Saeed said the Pakistan Tehreek-e-Insaf’s proposed scheme targeted the rich men, they added. Both the communications minister and the water resources minister said that the scheme was against PTI’s core values of taking thieves and dacoits to the task, the sources said. “Prime Minister Imran Khan has constituted a cabinet committee to further deliberate upon the proposed Assets Declaration Scheme,” said Federal Minister for Information Fawad Chaudhry while briefing the media after the cabinet meeting. “The approval process of the tax amnesty scheme has for the time being been suspended,” said Fawad, adding that earlier the plan was to enforce the tax amnesty scheme within 24 hours. The cabinet wanted to discuss the amnesty scheme clause wise after some members raised objections, but the members were not able to sufficiently discuss the scheme, he added. The newly-constituted cabinet committee would meet on Wednesday (today) and the government will now take some time before announcing the scheme, said the minister. Finance Minister Asad Umar had to postpone a scheduled press conference due to the federal cabinet’s refusal to give him green light to launch the amnesty scheme. The government wants to launch the scheme through a Presidential Ordinance. Prime Minister Imran also directed to prepare a media strategy to sell the tax amnesty scheme and counter the opposition parties. The Federal Board of Revenue proposed three options for setting the minimum and maximum rates for repatriation of offshore assets, disclosure of domestic assets and legalisation of Benami assets, said the sources. The FBR had proposed a minimum of 5%, 10% and a maximum 15% rate for repatriation of offshore assets. For the declaration of domestic assets, it had proposed 10%, 15%, and 20% rates. For clearance of Benami assets, the proposed rates were 15%, 20%, and 25%. The PM was not in favour of allowing people to declare their offshore assets if those were not brought back to Pakistan. But repatriation of long-term assets such as investment in insurance policies, mutual funds, and immovable assets was not possible due to the limited time that the government wanted to offer to owe to the possibility of entering into an International Monetary Fund programme from July. Before coming to power, the PM had described the tax amnesty schemes as a source of legalising ill-gotten wealth by the ruling elite. But after coming to power, the PM had to consider a tax amnesty scheme within six months. The cabinet was informed that in case the tax amnesty was not given, people would have to pay a minimum of 40% income tax rate in addition to risking confiscation of Benami assets. But the debate on rates did not take place due to objections over the definition of the ineligible persons, said the sources. The FBR proposed that all the public office holders, their children, spouses, brothers, and sisters should be ineligible for availing the scheme. The sources said that the law minister was of the view that the brothers and sisters could not be declared ineligible. He is said to have taken a position that this might raise the question of violation of Article 25 of the Constitution that guarantees equal rights to all. Barrister Farogh Naseem’s version could not be obtained before the filing of this news story. The sources said that some other federal ministers also opposed the scheme, saying that it was not politically sellable. They said that one of the most vocal members was the communications minister who said that the amnesty would bail out those who did not pay taxes but the poor people had been thrown behind bars for just a few hundred rupees. The Pakistan Peoples Party has already announced it will bring a resolution to disapprove the tax amnesty ordinance in the Senate. Article 89(2) of the Constitution allows the Senate to reject a presidential ordinance through a majority vote.